I'm certainly watching all the Olympic events I can manage to see. Did you see the opening ceremonies? Fantastic! Truly unbelievable. I can't even imagine what went into making that spectacular event. I watched it twice. And I never watch anything twice, or nearly not. 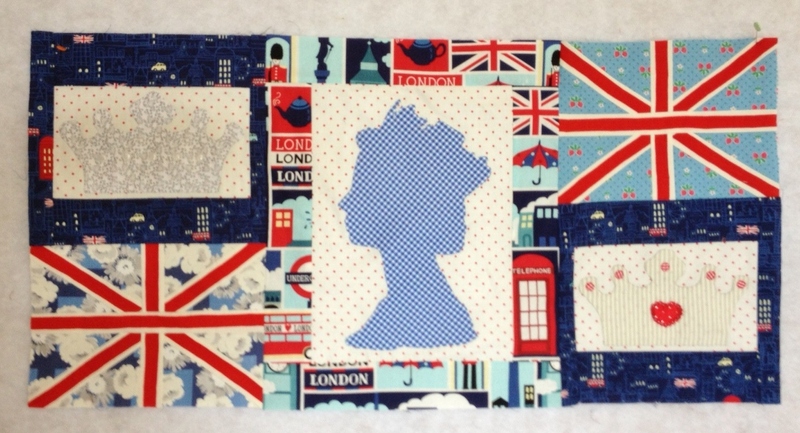 I am so glad to be making my London 2012 quilt. I'm putting rows together but still not quite done making blocks. This is one of my groups of blocks together, above. 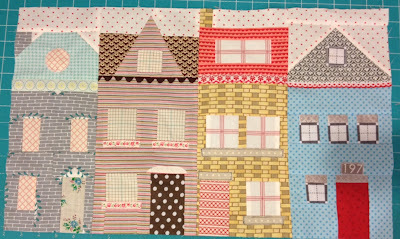 There will be lots of different fabrics sashing and framing my blocks. I'm starting at the center to build the quilt and working out. This is my take on the Olympic Rings. I know they are not actual rings but I wanted to make the spirit of the Olympic Rings into something "quilty". 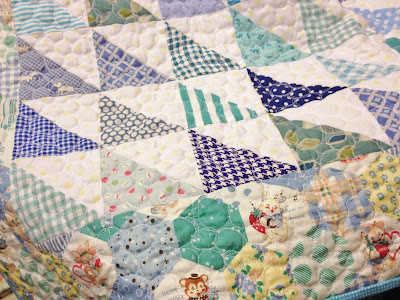 And what is more quilty than hexagons? (well, mine are faux hexagons) My husband kind of rolls his eyes at this quilt since he really doesn't "get" the Olympics or my admiration for the queen. However, he even watched the opening ceremonies and didn't complain once. In fact, he was rather gob smacked like the rest of us. Wasn't it fabulous? 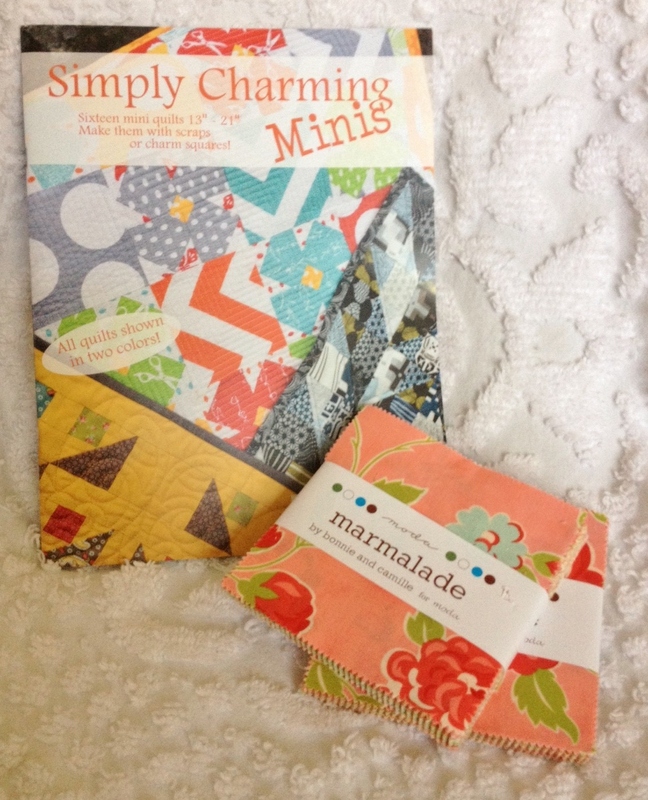 The Winner of Konda's book "Simply Charming Minis" is TexPat, who said: "I love mini quilts and your little basket quilt is adorable. Would love to win the book! Thanks for the chance! " Pat, I will give Konda your email address and she will get you the book pronto. Congrats to you. Thanks everyone for the entertaining and sweet comments. I appreciate you playing along. Today is my day to post about Konda's new book "Simply Charming Minis". Konda has been writing patterns and making quilts with incredible success for many years. I remember when she wrote her first book for fabric precuts. I thought then and think now that she's such a great quilt author. I was excited to be involved with Konda's latest book. Konda states that she's been watching mini quilts being made from the sidelines of the blog world and was excited to jump into the "mini" arena. I've been watching mini quilts pop up everywhere, too. So I thought this was a great opportunity for me to make my first mini. 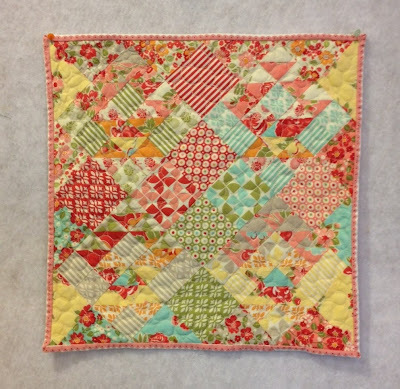 I chose the Marmalade charm pack that I had sitting on my cutting table and paired it with the Mini Basket pattern. It is kind of hard to pick out the baskets in this photo because Marmalade is so full of color and pattern. I really loved making this mini. And as I have stated, Konda's instructions made it super easy. I cut the binding so I could pair this scallop to edge the mini but I admit I cut it a tad "off" but it worked out ok, I think. I will definitively want to make another mini. From start to finish this is a project that lasts less than a day. What a treat to make and enjoy. Leave a comment to have a chance at winning this book and you can make a mini from Konda's newest book, too. Sew fun. 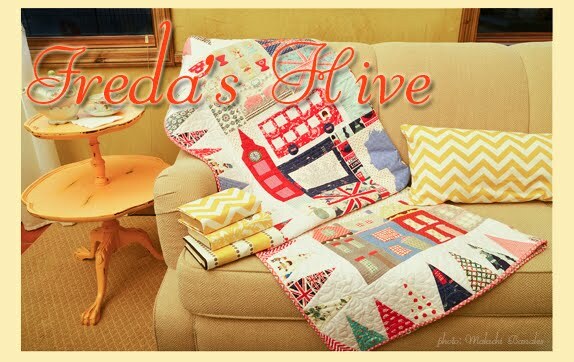 Konda of Moose on the Porch Quilts has a new book out and I was so excited to get her new book and plan a project. I met Konda several years ago at a retreat in Bryce Canyon. She's a great teacher and an amazing quilt designer and most importantly she knows how to write instructions. More about my project on Wednesday when I'll show you the mini I made from Konda's book. Until then, visit the blogs on the tour and enter the giveaway. 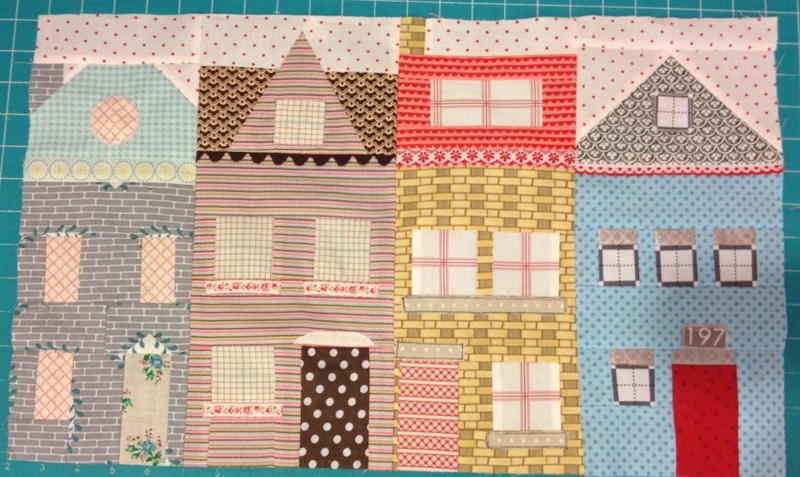 Lori is having a Great-Granny Block Along this month. 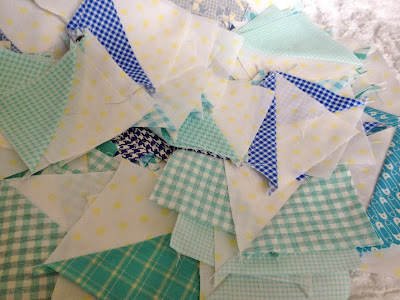 I've been looking forward to Lori's block party but find myself overwhelmed and totally incapable of making a completely new project right now. 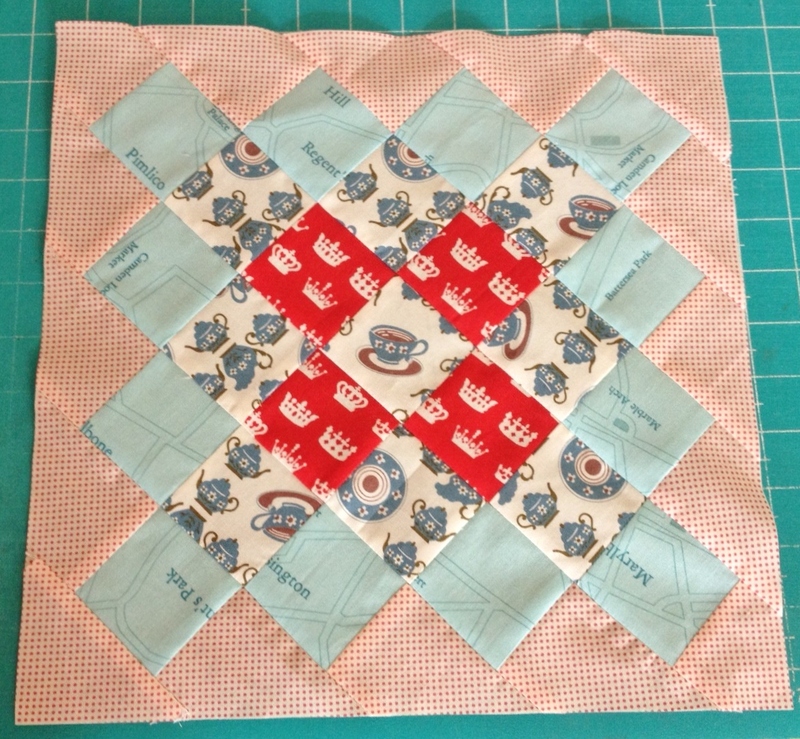 However, considering Queen Elizabeth II is a great grandmother, I thought I could squeeze one great-granny block into my London 2012 quilt. After all, the theme fits Queen great-granny. 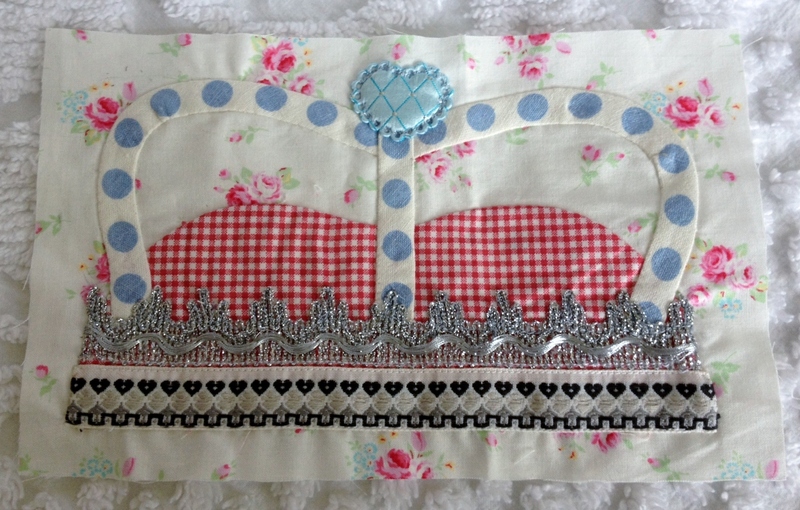 Using teapot/cup, crown, and London street fabric, I managed one very nice great-granny block. It was quite fun and yes, these are addicting. However, I will have to stop at just one. For now. This weekend I'm going to lay out more blocks and start assembling London 2012. At some point I have to call it enough. My heritage quilt is by far one of the best accomplishments for last year. 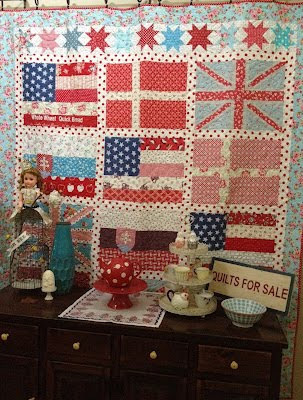 I really loved making blocks from flags that represented the countries my ancestors came from to the United States. I'm 1/4 British, 1/4 Danish and 1/2 Slovakian. I'm so proud of that. I am proud that I had ancestors strong enough to come to a new country and risk everything because of their quest for a new religion or for hope of a better way to make a living for their family. In particular, I'm especially grateful for my Slovak grandparents. 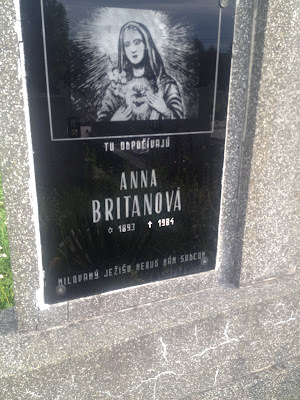 My grandmother never spoke English and always wished to go back and visit family in Slovakia. My father always wanted to go see where his parents lived and go back to "the old country" as well. But neither of them made it. I am sure that I won't make it to Slovakia myself, either. My daughter Chelsey is spending the summer working in Europe as a make-up artisit. She had the opportunity to accept work in Bratislava Slovakia this week. My dad would be so proud and happy to know one of his grandchildren was able to go back to Slovakia and visit the town where his parents grew-up. Chelsey and her friend rented a car and drove the 6 hour rural road from Bratislava into Bela Nad Cirochou, the little tiny village in the Snina area of Slovakia. Chelsey tried to translate this via Google for me. 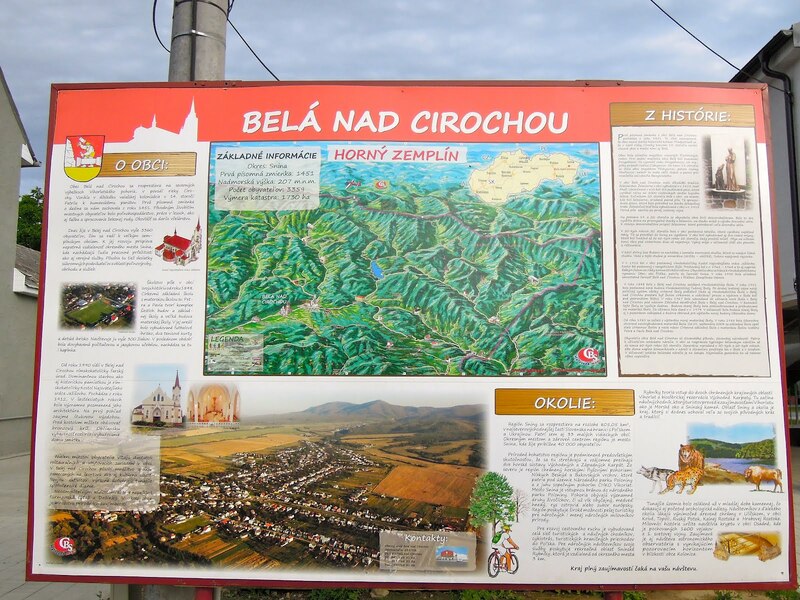 I actually don't know much about the town of Bela and really I don't know much about the life my grandparents, Jacob and Mary Breton (Britan, Brittan) lived in Bela, except it was near a beautiful lake and was a green, lush area of the world. 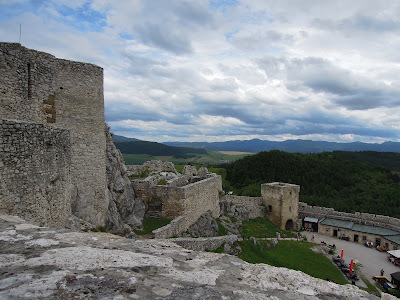 I had no idea that there were very old castles in Slovakia. This castle is called Spis Castle. But apparently there are dozens and dozens of castles there. 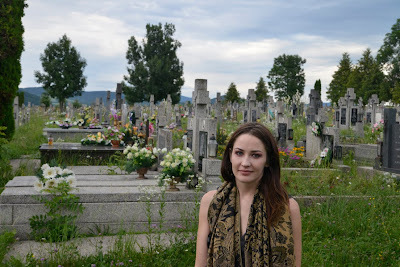 One of the things I wanted Chelsey to do in Bela was to visit the cemetery. I understand I am related to most of the people in that cemetery. Britanova would be the feminine of Britan. When my grandfather arrived at Ellis Island either he or someone there changed the spelling of Britan to Breton. I grew up being a Breton. 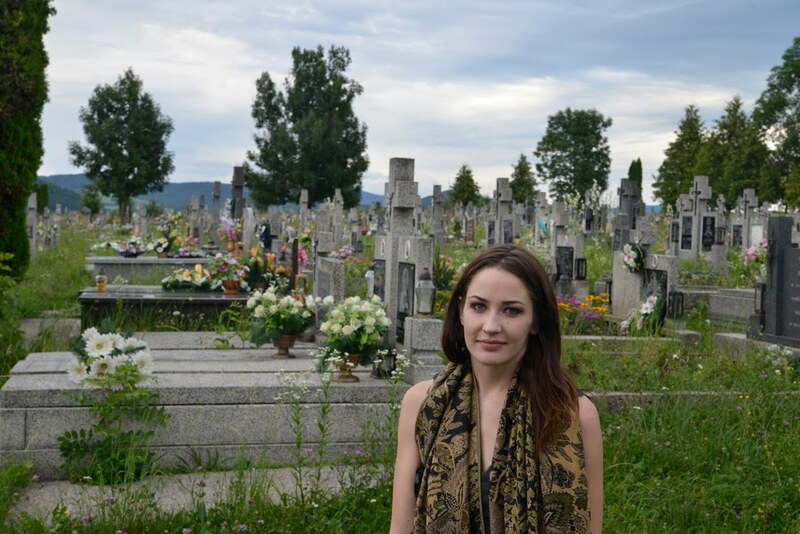 Chelsey said the cemetery is very beautiful and there were flowers on nearly every grave. I was deeply touched by that. I think our ties to our ancestors are very strong and I'm sure they are incredibly happy to have Chelsey visit the village where our heritage still lies. Stop the presses. 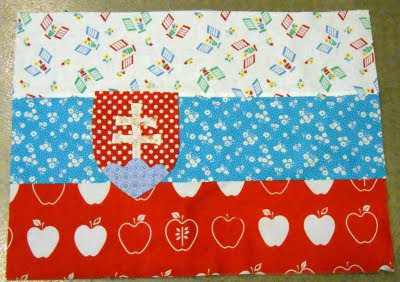 I have to interrupt creating London 2012 to make a couple baby quilts. 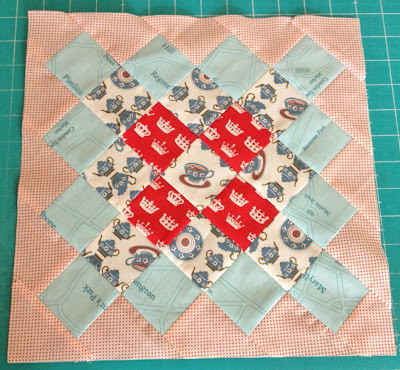 I'm slightly derailed with this so I may not make progress on London this weekend but I hope I have 2 baby quilts when Monday rolls around. I really need to make more scrap quilts, or rather more stash quilts. 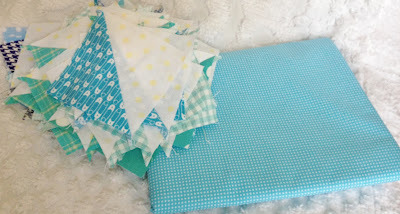 So when I decided to make a couple baby quilts I decided to use what I had on hand. What a novel idea! 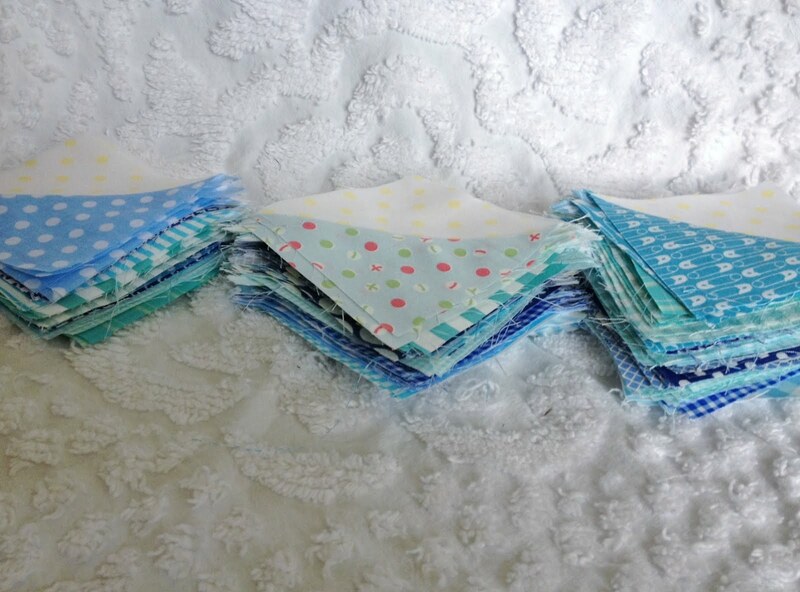 I love half square triangles and I really love simple quilts for babies so I decided just to cut 4.5" squares and keep it basic. Since these are boy quilts I want to exclude florals. And so I expanded my blue palate to include aqua and green/blue through navy. 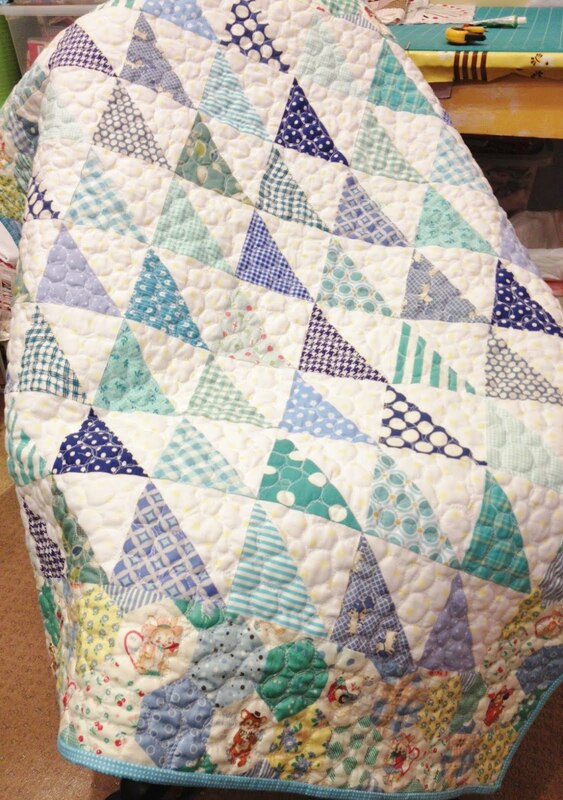 I know some quilters shy away from incorporating so many shades in one quilt. Not me. 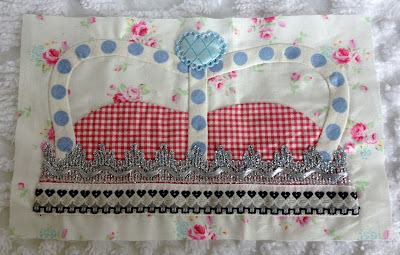 My opinion is that if it is going to be a scrap/stash, then I want to use lots of different fabrics. 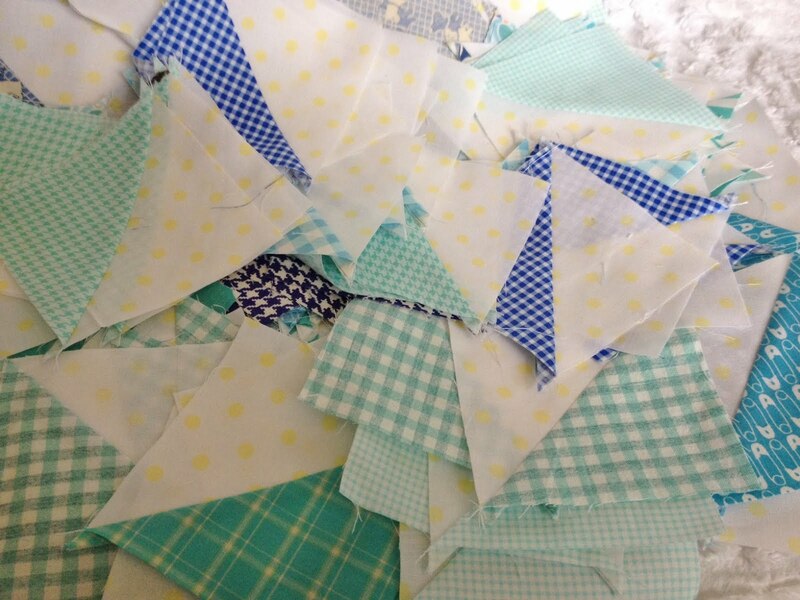 My half square triangle blocks are ready to stitch into rows. I'm really going to try to get these put together AND quilted this weekend. 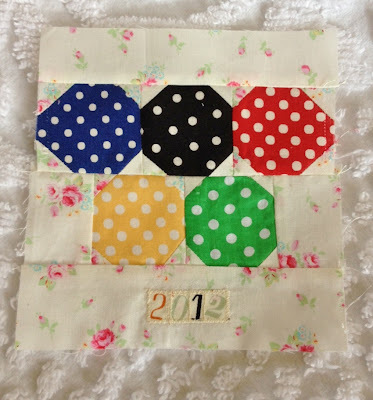 More blocks from my London 2012 quilt follow. I've been working on these crowns for a couple months now. 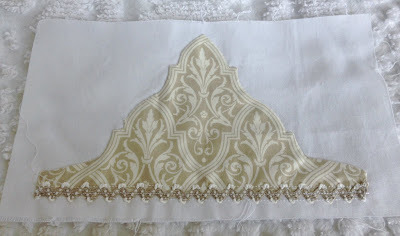 I wanted to embellish them but in a more grown up way than my "Dreaming Princess" quilt. 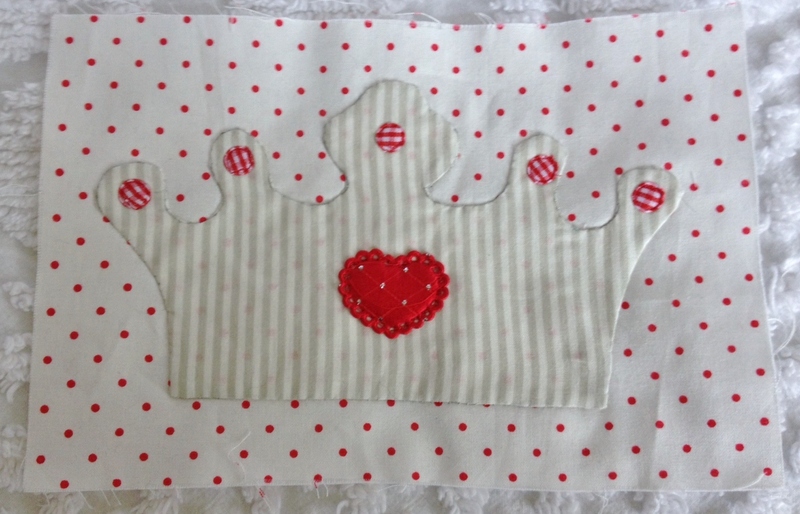 I used the same pattern for the first 2 crowns. 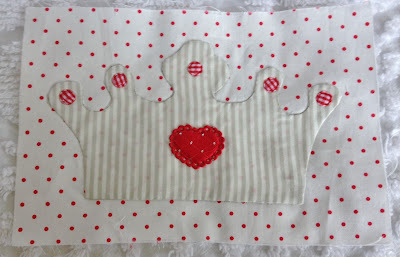 I don't know if you can make out the little round fabric crystal like appliques on this crown above. 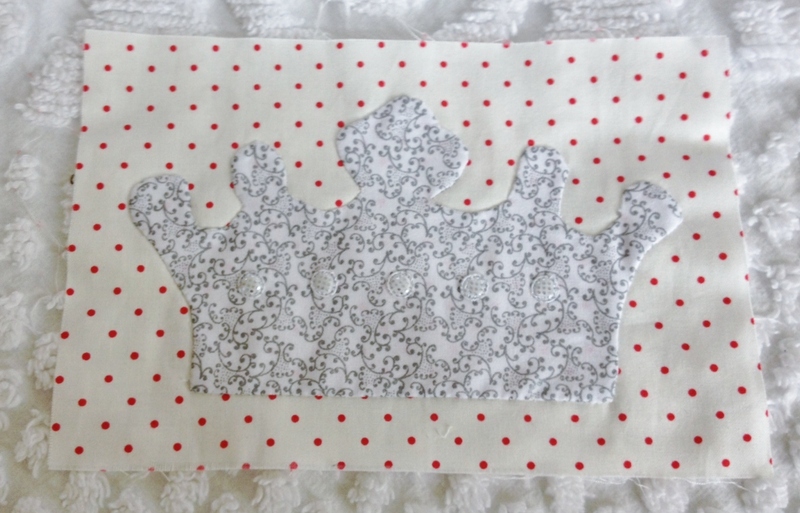 This crown shows the dots from beneath ever so slightly but I decided not to block them with an under cloth simply because it adds a little depth to the crown. 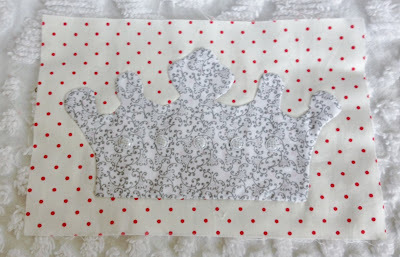 This is the most whimsical of all 4 crowns, I think. I looked for fabric that would look like a filigree to represent a mature looking crown. It looked a little plain so I added this bit of same color rick rack to the bottom. This one is my favorite. 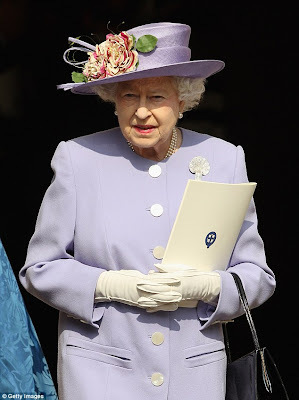 Shelbie told me it is not a crown but a coronet. I thought about how to make this last design for a couple months. After making my London Eye, I realized I could use the same idea of a bias strip of dots to create the effect I was looking for. They have been fun to make. I'm starting to sew blocks together for my London 2012 quilt. Since I have no overall drawing for the finished project, I'm a little nervous about it. 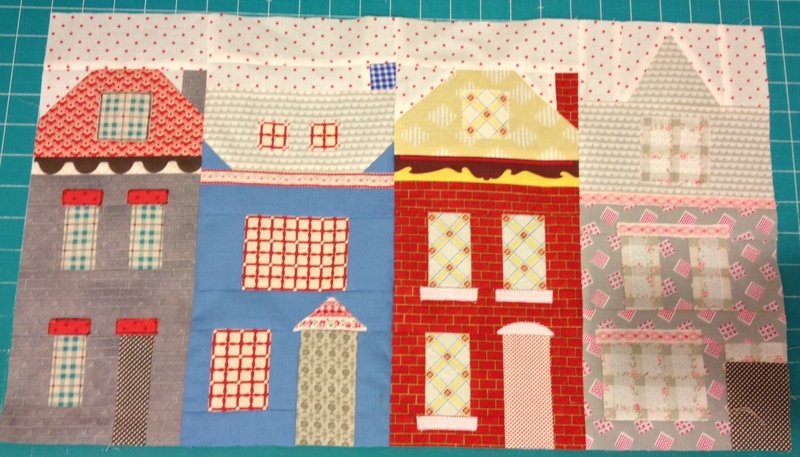 Up until now I've just had theme blocks drawn and sewn. 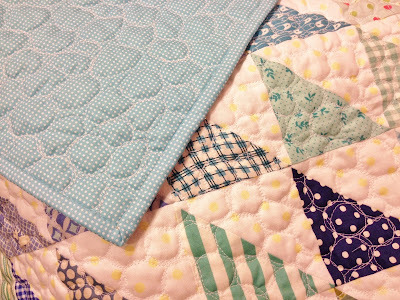 But, now I've got to start making a real quilt out of the different blocks. First I've got my 2 sets of row homes. I really wanted them to all look similar in size but unique in features. 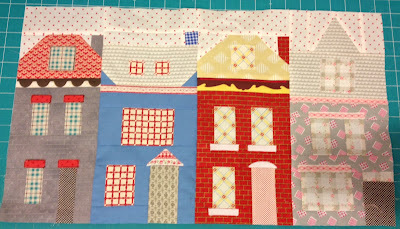 I'm going to have the row homes on opposite corners of the quilt. 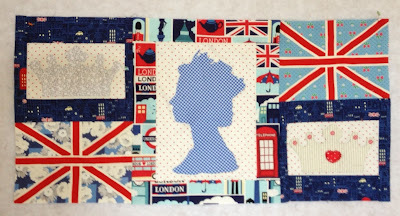 I'm hoping as I bring all my London blocks together that by using sashing it will become a cohesive project. 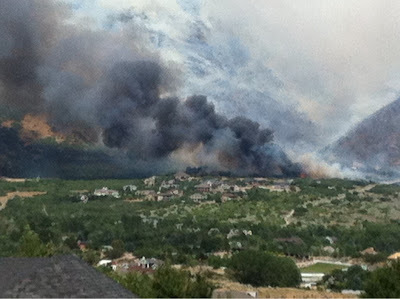 Starting mid day on Tuesday this week, a fire started on the mountain in the northeast corner of Alpine. It has caused evacuation of 500 homes in my town. Because I've had calls and emails from friends wondering if we are okay I thought I would make a post. This picture was taken from my friend Dustin Davis's twitter pic. It shows the fire so near to homes but luckily no homes have burned right now. The fire looked better this morning when I left home at 7:30 but it is still only 10% contained. Whatever that means. 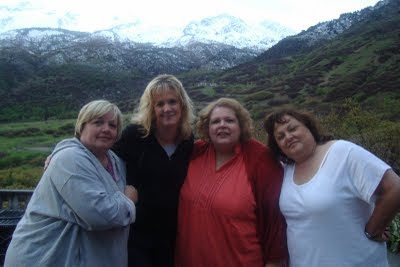 This photo of Lori, Elizabeth, me and Pam was taken a year ago after quilt market in Salt Lake City. We were staying at Alpine Quilt Retreats at the home of my friend, Syd. 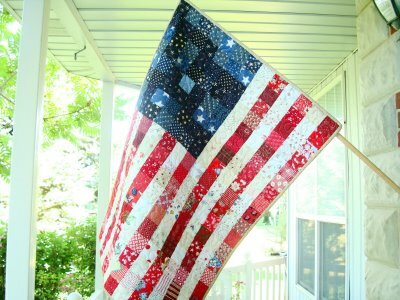 Syd has a beautiful home with amazing quilts and accommodations. Behind us in the photo is the would-be burned area and very close to the area where the fire started. The view from the deck at Syd's was breathtaking. See Syd's back yard (basically) here. My house is on the other side of town and we were not threatened by any fire problem. I feel for those that have had to leave in such quick notice. I'm so glad that the homes have been safe. I hope friends and family can get back to their homes today or very soon. Thanks so much for prayers and concern. Edit: We had rain today! And all Alpiners are allowed back at home. Unfortunately I have no internet at my house due to the fire. Happy Weekend, all. I've got a hugely busy week this week so I hope to wish you all a Happy and Safe 4th of July. It is so dry in Utah right now. No fireworks are even allowed in our city this year. But we are pretty low key on the 4th anyway. What are you making for your 4th of July menu? I promised my daughter Jamie I would make macaroni salad. My friend Nan and Taste of Home have some great holiday recipes you might want to check out. Please everyone who can log into Facebook, do me a big favor. My friend Nan has a great blog called Pots and Pins. Nan is in a contest sponsored by Taste of Home. Nan is sew sew deserving of the Mrs. Holiday prize. So first log into Facebook. Then use THIS LINK to vote for Nan. I think you have to "like" Taste of Home first or something and then vote for NAN. You can vote everyday. It only takes a moment. Thanks! !